Lars Brownworth answers your questions from the 12 Byzantine Rulers, Lost to the West and Norman Centuries projects. 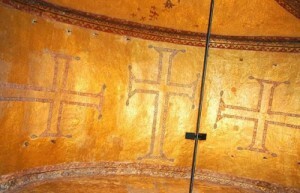 How much influence did the Pope have in Byzantium? Jack asks how much influence the Pope had in Byzantium before the Great Schism and how that crisis affected the Empire. Constantinople’s attitude towards Rome was always a complicated one. On the one hand, the bishop of Rome had a uniquely respected place in the early church. Peter, who had been entrusted with the ‘keys to the kingdom of heaven’ had founded its church, and as such it had far more prestige than the relatively late church of Constantinople. The Pope was the ‘first among equals’, due a special reverence and respect. On the other hand, however, Constantinople was the residence of the emperor- God’s regent on earth who looked after the physical well-being of the faithful in the same way the church looked after its soul. They resented the increasingly authoritarian claims of the Roman church as it moved from ‘first among equals’ to simply ‘first’. The Orthodox view was that each of the five major bishops of the Church (Rome, Antioch, Jerusalem, Alexandria, and Constantinople) had an equal voice- Rome was in effect an elder statesman not a dictator. As the East and West went their separate ways politically, the Pope became a useful tool for the Emperor to use if he disagreed with his Patriarch. In the case of Leo the Wise, for instance, when his church rejected his bid for a fourth marriage, he referred the matter to the Pope, knowing that the pontiff would eagerly grant him a marriage in exchange for publicly ‘overruling’ the Patriarch. This was a political gambit- nothing more. But it does show that the Pope’s opinion still mattered- the ‘senior’ bishop of Christendom had weighed in and- over the Patriarch’s objection- Leo got his 4th marriage. As for the Great Schism, 1054 is a nice, clean date for historians, but is relatively meaningless. As Sir Steven Runciman wrote ‘a schism only exists when a majority of individuals believe it does.’ Clearly this wasn’t the case in the 11th century. A hundred years after the ‘Schism’ the emperor Manuel Comnenus wrote to the Pope, offering to act as the ‘sword arm of the Church’ in the reconquest of Italy from the Normans. The Pope accepted- hardly the actions of people who considered the other side heretical. What really put the nail in the coffin of Church unity was the 4th Crusade. After that tragedy, there was no real possibility of reunion. 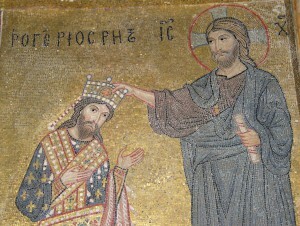 As the Byzantines famously put it- ‘better the Sultan’s turban than the Pope’s mitre.’ While the Orthodox church maintains even today that they will welcome the Pope back into his favored position if he admits his errors, practically speaking all papal influence on Byzantium ceased in 1204. How hard was it to see a Byzantine emperor in person? Almost impossible. The emperors were removed from the masses both as a security measure and a means to emphasize their distinct and sacred nature. For the select few, however, it was possible. The emperor Constantine VII Porphyrogenitus (913-59) left us a detailed description of protocol called the De Cerimoniis. From it- and from the writings of the visiting diplomat Liutprand of Cremona- we can piece together a “normal” visit to Constantinople’s throne room. Liutprand was of very important rank (though not quite so high as he thought) and so was seen rather quickly. He arrived in a pouring rainstorm and only had to wait several hours outside the Chalke- the massive bronze entrance gate to the Great Palace complex- before being admitted. He was quartered in a large mansion (he complains that it was too drafty) and was left there for six days before being summoned. He met with the imperial chancellor- in this case the emperor’s brother- who instructed him how to address the emperor, where to stand, and when to kneel, etc. A day later he was led by two eunuchs into the Chrysotriklinos- a palace containing the main throne room. As he approached, the famous mechanical birds and golden lions began to sing and roar- a psychological maneuver calculated to awe the unsuspecting diplomat. But Liutprand had been informed of this part of the spectacle and cooly knelt before the emperor without betraying any surprise. After the customary three bows he looked up and was stunned to find that the emperor’s throne had risen up to the ceiling and its occupant was now wearing a completely different set of robes. The emperor then addressed Liutprand at length after which he was allowed to deliver his message. Liutprand and his entire party was then invited to a banquet. This was in effect the closing ceremonies where you could gauge how highly you were in the emperor’s favor by how physically near to him you were positioned. Liutprand as usual was offended- he complained that he was 15 tables away and without such basics as a tablecloth. The meal itself, however, was a true spectacle. The golden dining room was lit by great chandeliers, glittering imperial regalia, and relics from various churches scattered throughout the room. Music was provided by the choirs of the Hagia Sophia and the Holy Apostles, accompanied by music from two silver and golden organs. Liutprand’s only comment about all of this? The food was too oily. Pavel asked how far east a Roman army ever campaigned. 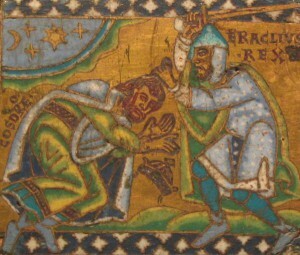 Heraclius invaded central Persia in the spring campaigning season of 624. 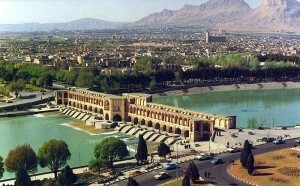 He reached as far east as Isfahan- then called Aspaban- farther east than any Roman army before (or after) would ever go. There was nothing preventing him from continuing on, but by then there was little need to. 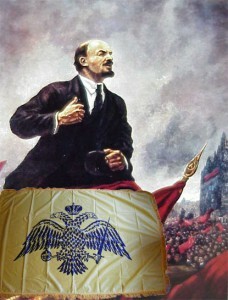 The Persians had seen their rash emperor nearly swallow Byzantium only to lose it all and more in the blink of an eye. 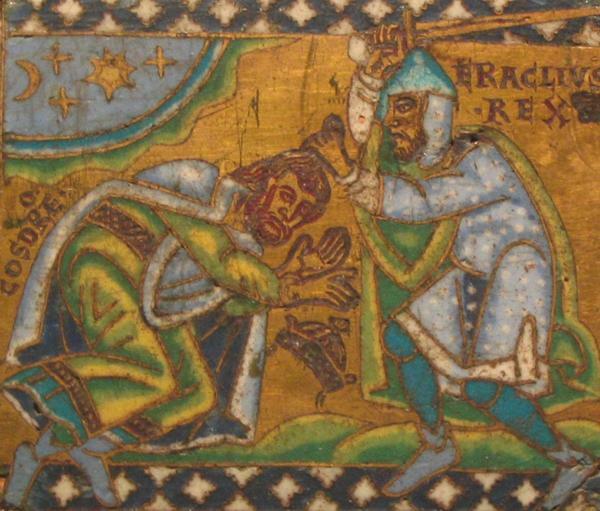 When Shar-baraz, Persia’s best general, refused to engage Heraclius in battle, Chosroes II ordered him to be arrested and executed. Unfortunately for the paranoid Shah, Heraclius intercepted the letter bearing the command and- after adding a few names for good measure- passed it along to Shar-baraz. The ill-advised Persian housecleaning was the last straw. People and army rose up and Chosroes II was overthrown. What language did the Normans of Sicily speak? Jack asks if the Normans of Sicily spoke French or Italian. Roger I and his successors spoke the Norman dialect of French. But though this was the court language it wasn’t adopted by most subjects. (In a similar manner Norman French became the ‘official’ language of England for roughly two centuries, but the wider population retained their Anglo-Saxon) Most of the Norman’s subjects spoke Greek or Arabic, and continued to do so. The greatest linguistic influx was Italian as the Norman kings brought in mainlanders to repopulate land abandoned by the Saracens. Gradually this formed a unique language- Italian with loan words from French, Greek, and to a lesser extent Arabic. This Sicilian dialect still persists, though of course with modern communications and mobility its future is uncertain. Mainland Italian is taught in schools and the younger generation of Sicilians are much more likely to speak it then their regional dialect. Where did the Turks come from? Jodi asks where the Turkish people originated from and how they ended up invading the Byzantine empire. The Turks are relative newcomers to Anatolia. They are part of a much larger linguistic group called ‘Turkic peoples’. This would include the Bulgars, Avars, Uyghurs, Uzbeks, Petcheneges, and possibly Huns among many others. They all seem to have originated in Central Asia, probably near the Altay mountain range where modern Russia, China, Mongolia, and Kazakhstan meet. The Seljuk Turks started to migrate west as early as the 6th century AD, but the main exodus took place in the 11th century when they were pushed by the Mongols. In 1071 they crossed Byzantine territory (Armenia) on their way to Egypt when the imperial army under Emperor Romanus Diogenes confronted them at Manzikert. 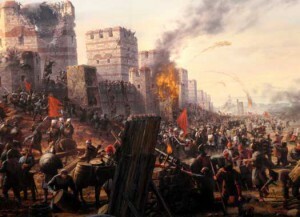 The resulting three day battle was an almost unparalleled disaster for Byzantium. The army was destroyed and Romanus himself was captured. Even worse, the Seljuks (who had previously contented themselves with raiding) flooded into Anatolia, permanently wrenching it from Constantinople. The Seljuk empire, however, didn’t hold together for long. In 1299 a young Turk by the name of Osman broke free from the collapsing Seljuks and founded his own state which was named Ottoman in his honor. By 1461 the Ottomans had absorbed the last remnants of Byzantium and had pushed deep into Eastern Europe. Their empire would last until the end of the First World War, at which time it was largely carved up by the Great Powers. The areas where the Ottomans were ethnically dominant (more or less) became the the borders of modern Turkey. 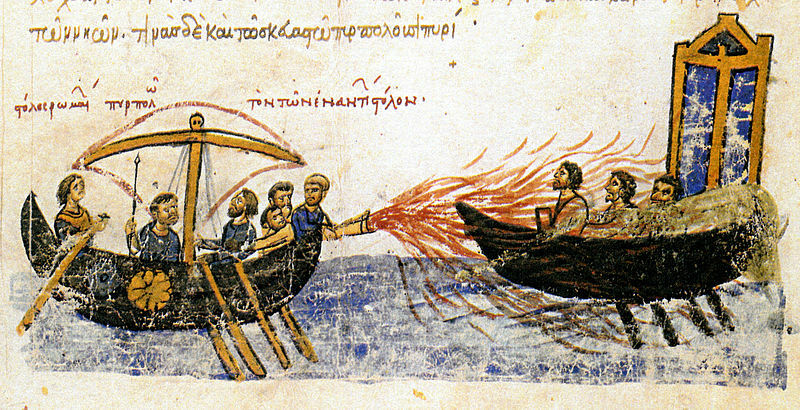 Was the recipe for Greek Fire ever stolen? 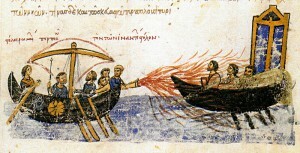 Juan asks if the Byzantines were the only ones to use Greek Fire. Greek- or ‘Roman’ Fire as it was known by those who were on the receiving end- was the closest guarded state secret of Byzantium. It’s effect was almost more devastating psychologically than physically. To watch a brother-in-arms burn alive with flames that couldn’t be put out (even under water) must have been a terrifying ordeal. Seeing pots of it come flying through the air (“like a dragon in flight” according to a French nobleman who had the misfortune to experience it first hand) shattered the morale of more than one army. Not surprisingly there were many attempts by foreign powers to get their hands on its secret. Diplomats scurried back and forth from several surrounding nations trying to deal for the recipe- but all in vain. The emperors of Constantinople were fully aware of the value of their secret weapon. 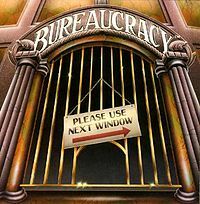 In fact, they were reluctant to use it too frequently for fear that it could be reverse-engineered or lose its psychological potency by overuse. They were right to be worried. 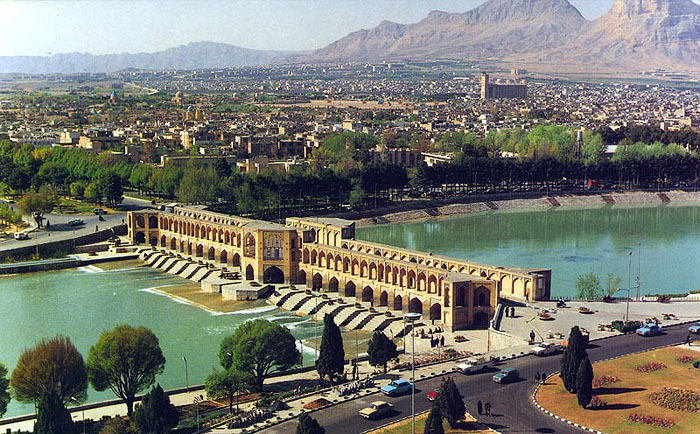 Sometime before the eleventh century the Arabs managed to develop their own version, though it was far less effective. It seems to have fallen out of favor with the Byzantines themselves by the 12th century- perhaps because they had lost control of the areas (around the eastern edge of the Black Sea) where they obtained the ingredients. There is a mention of its use during the 4th Crusade, but whether it was actual Greek Fire or simply ships set on fire is not clear. In any event, it’s day was done. The spread of gunpowder made Greek Fire obsolete and it disappears from history. What did the Normans call themselves? Shannon asks when the term Normans was first used. Unfortunately there are no surviving written records of the treaty of Saint-Clair-sur-Epte, so we don’t conclusively know what their contemporaries called them when they first landed on French soil, but it’s a safe bet that they were always referred to by some variation of ‘Norman’. Rollo and his immediate followers came from Norway, Denmark (and possibly) Sweden- a relatively spread out geographic location- so they collectively called themselves the Northmen. 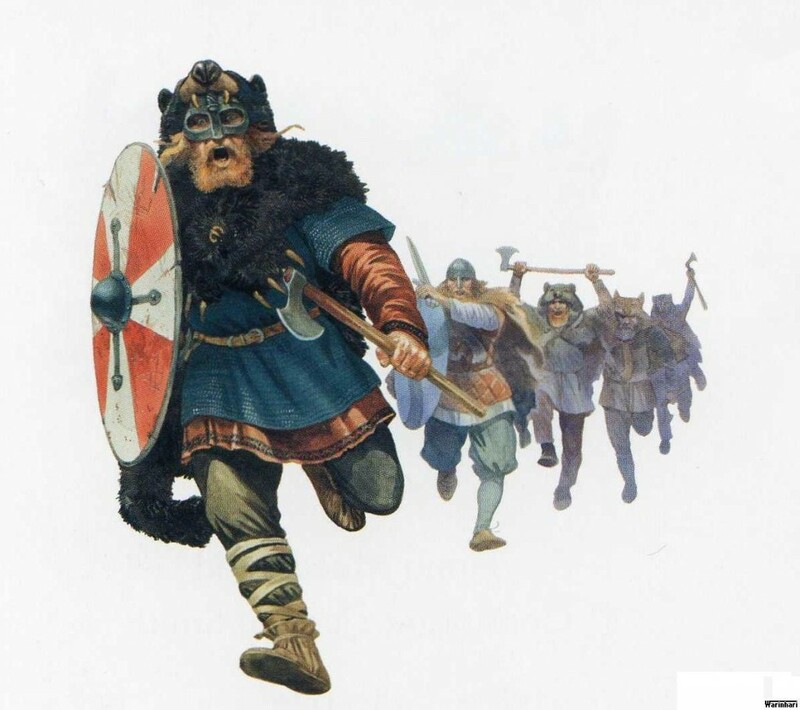 (The term ‘Norman’ comes from a viking word meaning ‘Norseman’ or ‘Men of the north’- so it would also have been a perfectly natural label for the Franks to apply to the incoming raiders from the top of Europe.) The viking word was latinized to ‘Nortmannus’ which in turn became ‘Norman’. We know they adopted this name because (fortunately for us) the Normans loved to hear stories about their earlier heroes, and the subject of the first major Norman writer (Dudo of Saint-Quentin @1020) was his own people. Showing typical creativity he titled his history of the Normans ‘Historia Normanorum’.